Following his senate confirmation last week the new UNETIDA/UNPASID Director Lt. General "Stomper" Santorno took command at a ceremony at UNHQ on Monday morning. It was attended by members of the UNSC, The UN High Commissioners for Paranormal and Extra-Terrestrial Affairs and multi-national officers serving with both UNETIDA and UNPASID. Rear Admiral "Smokestack" Henderson who had been serving as Acting UNETIDA Director, presented the general with the his organisations command flag. 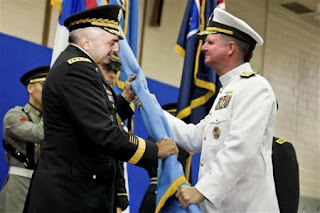 Colonel "Tucker" Reid UNPASID's Director of Training as the most senior remaining UNPASID officer after a series of unfortunate events last month, also presented Santorno with the UNPASID command flag, a symbolic gesture that will see the general unite both directorates. In his first speech to the assembled UNETIDA and UNPASID personnel, Santorno assured that despite what his appointment represents, it was his mandate that the missions and operations of each unit would be given the same attention that they have always deserved. The general offered that while there will be some change, he hopes that the directorates can make those changes work for the better to ensure the ultimate success of "keeping the world safe from things it's not ready to believe in". Santorno praised the work of Air Vice Marshal "Albatross" Davenport III in strengthening UNETIDA and upgrading the policies and technology while he served as director. The general had also words of praise for Rear Admiral "Smokestack" Henderson whom he said had to take command of the directorate during a difficult time during it's scrutiny. Santorno said he had asked Henderson to remain with UNETIDA/UNPASID in a senior leadership role, an offer the admiral has accepted along with a nomination for his second star from POTUS. Santorno said that he was deeply upset by the events that decimated the UNPASID leadership, but was especially saddened by the passing of Major General "Skullcrusher" Shaw whom he considered a close personal friend. He said that Shaw had shown tremendous devotion to the UNPASID mandate and promised to do his best to bring the same level of zeal to the counter-paranormal cause. He also vowed to use all the resources at his disposal to investigate the events that lead to Shaw's death and the death and disappearance of other senior officers. Santorno closed by telling the assembled personnel that he, and the senior staff would be meeting with the UNSC on Wednesday 22nd of August to finalise the appointments of a fully integrated unified command staff and begin discussions for a permanent amalgamation of UNETIDA and UNPASID as it is clearly the best way forward for both. "For now" he concluded "It's business as usual." Do any of these guys ever have nicknames like Cuddles, or Fluffy, or are they just not man enough? There was "Kittens " Keller but they don't talk about him, notsince he was drummed out of the service after that incident with the schoolbus and the "necklace" of ears..i still don't understand why he claimed it was for "research" purposes. Less said about Kittens the better Vaughan. There is "Huggy" von Gruber. She's UNPASID's unarmed combat instructor in Germany known for being able to crush a spine by bear-hugging [she's also 'man' enough by the looks of her anyway]. There is also a Warrant Officer "Bunny" Buntello. He is the range officer at the UNETIDA R&D proving grounds in Arizona. No one laughs at his name, he's the kind of dude who uses barbed wire to floss.